How much does it cost to grow your own garlic? As I poked holes in a straw mulch to plant individual garlic cloves this week, I pondered whether we were saving money by growing our own garlic. I usually figure we're saving quite a bit of cash with our garden, but we did buy a lot of soil amendments this year as a long term investment in our soil's fertility. Are we still coming out ahead? A cost-benefit analysis of the backyard garden is a tough task because it's hard to know where to begin and end your calculations. Seed is the least straightforward part of analyzing this year's garlic cost --- we didn't spend anything on seed this year, but we did buy two pounds of seed garlic a couple of years ago for $45. On the other hand, while seed potatoes tend to accumulate diseases over time, seed garlic only becomes more acclimated to your region and produces bigger yields in subsequent years (as long as you are careful to always plant the biggest cloves from the biggest bulbs.) I figure we'll use the descendents of that seed garlic for the next sixty years or so, giving me a cost of around 75 cents per year, or 4 cents per bed. We traded a dozen eggs and a butternut squash for the horse manure I used to fertilize the beds, which probably shouldn't even factor into the cost, but I'll give it a shot. Our chickens are currently eating about $30 worth of chicken feed per month and giving us back about 90 eggs (on the low side since the days are getting shorter and we have a hanger-on who needs to go in the pot.) That's $4 per dozen eggs (mental note: we need to get off the commercial chicken feed.) I saw a butternut for 99 cents at a fruit stand the other day, so I'll say we spent $5 total, or 28 cents per bed, on fertilizer. Straw is expensive in our region since no one here grows grain --- about $5.50 per bale. (This is another input I want to work on growing myself.) But a bale is also a lot more mulch than it looks like. 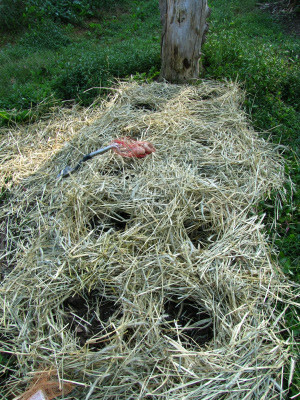 Once you fluff up the flakes, one bale of straw mulches 6 beds, giving me a cost of about 92 cents per garden bed. Total of these three storebought inputs is $1.24 per bed. Assuming our harvest is about the same as last year's (even though it's likely to be higher, as the garlic continues to acclimate to our soil and weather), we will get about 1.4 pounds of garlic per bed. That comes to about 89 cents per pound of homegrown garlic. The internet tells me that non-organic garlic in the grocery store costs roughly $2.50 per pound, so we're nearly tripling our investment in just eight months. Clearly, growing our own makes financial sense. Our homemade chicken waterer makes financial sense too. It saves the average chicken-keeper hours per week previously spent cleaning filthy waterers. Too bad you cannot calculate in the taste factor into all this! Maybe not so much the garlic, but with the rest of your fruits and vegetables. I totally agree --- I'm convinced that the food we grow is not only tastier but much healthier than the food we could buy. Plus, you'll notice I compared it to the grocery store's cheapest garlic, not the more pricey organic garlic. My goal is always to grow really amazing food at prices vastly below the grocery store's cheapest food --- that way everyone can have the best food, not just those willing to sink a lot of money into it. 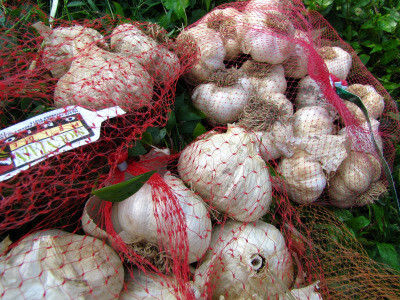 Am trying to price our locally grown garlic for an upcoming market.. great article, thanks! Aliza --- If you're growing for a market garden, you might not want to prorate the garlic starts over the next 60 years. (That said, ours are still going very strong several years later, and, yes, the yields have gotten better and better.) Good luck!